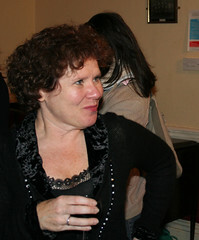 Imelda Mary Philomena Bernadette Staunton was born on this day in London, England, in 1956. She is 57 years old. Staunton, an only child, lived with her mum and dad over her mother’s hair dressing salon. Her mother was also a gifted natural musician who could pick up songs by ear (but couldn’t read music.) She passed on her love of music to Staunton who attended La Sainte Union Convent Catholic school. After graduation she attended the Royal Academy of Dramatic Arts. Musical theatre and Shakespeare fill her Stage CV. She won the prestigious Olivier Award twice. On film she landed a role in the ensemble movie Peter’s Friends with Kenneth Branagh, Stephen Fry, Emma Thompson and Hugh Laurie. She worked with Branagh and Thompson again in Much Ado About Nothing. Then paired up with Laurie as Mr. and Mrs. Jennings in Thompson’s wonderful adaption of Jane Austen’s Sense and Sensibility in 1995. (Thompson both wrote the screen play and starred in the film). She was Maria in Twelfth Night and the nurse in Shakespeare in Love. She stepped away from the crowd with a starring dramatic role in Vera Drake. She took home a BAFTA for Vera. In 2007 she, like many other classically trained British actors, found a new audience when she took a role in a Harry Potter film. Staunton played the nasty Defense Against the Dark Arts Professor in a fluffy pink cardigan, Dolores Umbridge in Harry Potter and the Order of the Phoenix. She laced up a corset again for her supporting role as Miss Octavia Pole in the BBC’s delightful adaptation of Elizabeth Gaskell’s Cranford (and again for Return to Cranford). Staunton has lent her voice to a number of acting projects including and animated version of the Wind in the Willows, The Adventures of Mole, The Adventures of Toad, The Ugly Duckling, and Chicken Run. She’s even did a turn as the voice of Interface on Dr. Who. This entry was posted on Wednesday, January 9th, 2013 at 11:10 pm	and tagged with Imelda Staunton and posted in England, Entertainment, Film, Musical Theatre, postaday, Theatre, Thought of the Day, Today's Birthday. You can follow any responses to this entry through the RSS 2.0 feed.